The College’s new online learning program – Lafayette ConnectEd – lived up to its name this January, when the pilot program connected students past and present with outstanding faculty for learning in a whole new way. The series of three one-week online courses was open to students, alumni, faculty, and staff. President Alison Byerly teaches her course. President Alison Byerly, one of the nation’s most prominent thought leaders on the role of technology in higher education, pitched the idea for a custom Lafayette online platform to John O’Keefe, vice president for information technology services and chief information officer. The program was developed in partnership with faculty, research students, and instructional technologists and funded by a donation from Bill and Doris Ju P’14 through the David MC Ju Foundation (courses were free for participants). Because the courses are non-credit and only a week long, it allows for more experimentation, says O’Keefe. Over 60 participants signed up for the courses, and preliminary feedback has been very positive, with many eager for future course offerings. 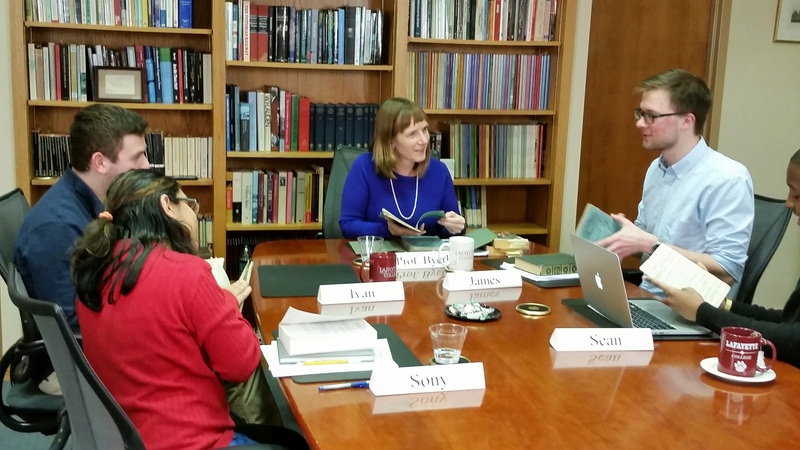 Participants were given shared assignments, including readings and online videos. Each course featured live discussion sessions allowing participants to exchange ideas and debate concepts. For two courses, there were students in person alongside the online participants, and one course was exclusively online. Byerly offered the first course in the series. Fictional Worlds was a study of how the narrative techniques associated with realism blur the boundary between fiction and reality in short stories, novels, and film. Participants discussed Arthur Conan Doyle’s Sherlock Holmes stories, Charles Dickens’ Great Expectations, J.R.R. Tolkien’s The Fellowship of the Ring, and The Matrix. No prior chemistry knowledge was required for Chip Nataro’s A Catalyst for Change. Nataro, professor of chemistry, examined the importance of catalysts in a variety of real-world settings including the pharmaceutical industry and energy production. Participants learned about the fundamental concepts of catalysis, including the latest research in the field.